Sarah Mills now known as Mrs Sarah Tanner is running a dining and coffee room in Leather Lane, London. An old friend calls on her unexpectedly and soon after is murdered. Sarah decides to avenge his death and seeks out people from her disreputable past and also realises that a local businessman and his ward are at the centre of the mystery. Aided only by her elderly waiter and the young girlfriend of the murdered man and unable to involve the police because of her past, and also because a police officer appears to be involved in the murder, Sarah risks everything to get to the truth. Mr Jackson has written four books based in Victorian London. This is the first of a new series featuring Sarah Tanner. The author also maintains a website devoted to life in nineteenth century London. The atmosphere and descriptions of Victorian life, as you would expect, are perfect. Sarah is a fine addition to fictional detection and her past is tantalisingly revealed but not completely, leaving her an element of mystery. A good book, far fetched in parts but I look forward to the next installment of Sarah. 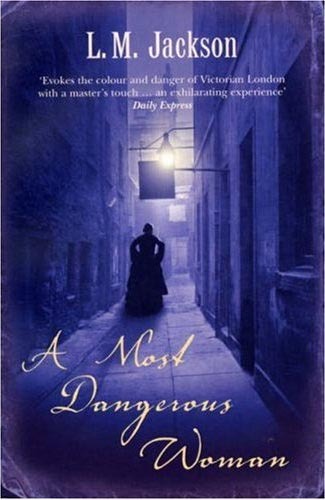 Read another review of A MOST DANGEROUS WOMAN.